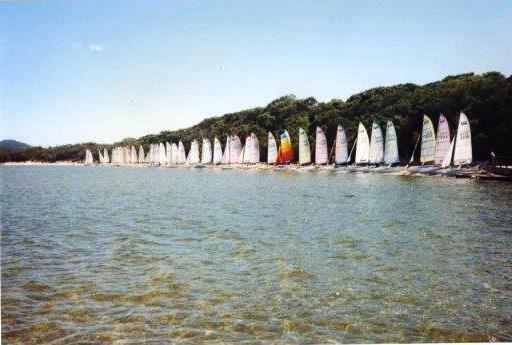 With the opening of the yachting season approaching, it would seem to be a good time to look back at the start of the very popular Walpole Yacht Club. A certain tourist holidaying at Rest Point in 1956 probably had no idea that he would be indirectly responsible for the formation of the Walpole Yacht Club. The idea had been tossed around for a time – why not, considering the beautiful waterways available. But Terry Swarbrick purchased a yacht – a VJ 12ft. 2crew – from the tourist in 1956 and sailed tantalisingly close to Claude Cooper and son Frank in their flattie one day in Swan Bay. The knowledge that there was a yacht in the town soon spread and it wasn’t long before a day was organised for interested people to meet and take part in a sail on the VJ. It proved to be a rather frightening and hair-raising experience for all, as there was a strong easterly blowing. Interest quickly spread as more VJs appeared in the district and old life jackets were obtained. One enterprising sailor even made a spinnaker out of an old parachute. For a time, sailing was confined to Swan Bay until they felt confident to conquer the waters of the Nornalup Inlet! Various district people were enticed on to the boats as crew and the story is that for some time, sailors and crew spent more time upside- down in the water than actually sailing! A shed was built to house the boats and the club was formed around 1957/58 with Terry Swarbrick as Commodore, Claude Cooper as Vice Commodore, Harley Swarbrick as Rear Commodore and Don Hadfield as Secretary/Treasurer. The first small regatta was staged in Swan Bay in 1958 and this was the forerunner of many successful competitions. There is a good deal to tell about those early days. (Article compiled from ‘My version of the history of the Walpole Yact Club’ by Frank Cooper).